Is your child interested in history but can’t find the right books to read? 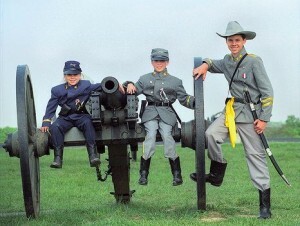 Or are you interested in history and wish you could instill that same interest in your child? Do you have a desire to see the history of the Civil War in the same way that the people of the times saw it? Well, Young Heroes of History is just what you may be looking for. Young Heroes of History is a series of books designed to tell the stories of our past to children in a way that is easily readable, fun and educational. The idea is to present children with stories about everyday kids like themselves who have to deal with the difficult situations of the past and somehow survive. We call our characters young heroes yet it is clear throughout all the books that these kids are just ordinary people in extraordinary situations. The characters in these books all have the same concerns and fault s that all children have: making friends, finding parental acceptance, being part of a family, and playing around. The reader therefore learns that they also have the qualities of a hero within themselves. Young Heroes of History also does not try to teach any particular point of view. Characters are male, female, black, white, North, South, free and slave. While most viewpoints are represented, the judgement of who was right and who was wrong is left up to the reader. We simply try to tell the story as it happened. The stories are gripping, in many times based on actual diary entries, and are filled with enough action and adventure to make the reader turn page after page without even realizing how much he or she is learning. Finally, since this is a series of books as opposed to a single book, Young Heroes of History allows for many themes over a long period to be discussed. The story begins with an Irish immigrant family in Boston but it quickly spreads south to Georgia, west to Kansas and all points in between. As the family becomes separated, the reader can see how the country became separated and follow each character as they go off on their own. Some members of the family become abolitionists, others become racist, some fight for the Union and others for the Confederacy. Also as a series, we have the time to explore the roles of other characters involved in the story. Book One, for example, focuses on the life of a runaway slave, Book Three on an orphan in Fredericksburg and Book five on a free black family which is introduced earlier in the series. However, the final magic of the series is that the books still stand on their own. While it is better to read them in order, it is not necessary, and indeed a reader with a particular interest can skip to the book(s) that interest him or her. Overall, the thing to remember about Young Heroes in History is that it makes reading history fun!